Trying To Add The 'M' Word (Menstruation) To The U.N.'s New Goals : Goats and Soda The Sustainable Development Goals refer to the needs a woman has when she has her period but don't use the "m" word. 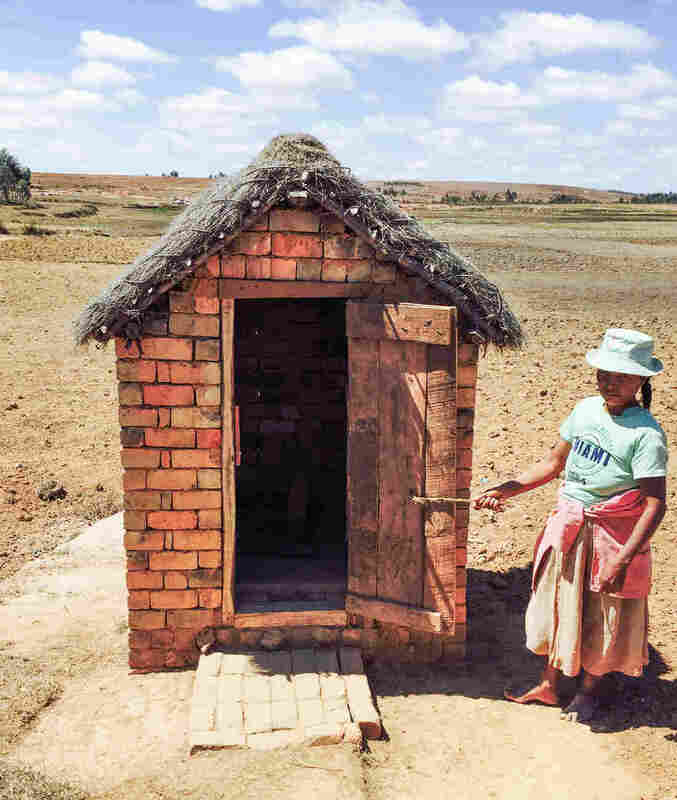 A woman in Madagascar stands by one of the new latrines in her village. The world pays a lot of attention to the first problem. And not so much to the second problem. But it turns out that when a village solves the open defecation issue, women benefit too. That's what is happening in Madagascar. The Global Sanitation Fund (GSF) has been funding education programs in villages like Ampasika Nord, about 60 miles from the capital city. Villagers once defecated in the open; now they have constructed 14 closed-pit latrines and hand-washing facilities for the 119 residents. That's a boon for everyone, but especially the women. "It has been better to have a period since the village became open defecation free," says Razananirina Ziliarimanana, a village elder and community health worker. "We need to go to the bathroom more during [our] periods and now we can take our time in the latrine, wash our hands afterwards, have more privacy. We don't have to rush and change our fabrics [to absorb the blood flow] in the field like we did before." "We find that it's women who are greatest sufferers when open defecation is practiced," says Dr. Rija Fanomeza, program director of Medical Care Development International (MCDI). "Women have shared their experience of stress and fear when it comes to finding a place for their sanitation and menstruation needs. But when a village becomes ODF, women speak with pride and enthusiasm about their village's sanitation and the convenience of a private place where they can take their time when they have their period." Funded by the GSF and with the support of Madagascar's government, MCDI is rolling out a nationwide open defecation free (ODF) program. So far 1.5 million Malagasy people are now living in an ODF environment. Global activists have taken on the issue of menstrual health in other ways, often by providing locally-made pads, such as AfriPads in Uganda and Sustainable Health Enterprises in Rwanda. However progressive the products are, women in a village like Ampasika Nord can't easily obtain them. It's a six-mile dirt road walk to a kiosk or small shop where they can buy even an improvised sanitary products let alone a product designed specifically for menstrual flow. Ziliarimanana and other Malagasy women say they use small yellow dish towels, which cost roughly 20 ariary, or less than 1 cent each, to manage their flow. By contrast, a single disposable pad costs 25 ariary, but cannot be washed and reused multiple times, thus remaining a luxury for most. "Safe menstrual management is made up of three interrelated important pieces: breaking the silence through discourse, information and respect for the female body; safe and adequate places to wash, clean, change materials; and safe and dignified disposal of used menstrual materials," says Archana Patkar, program manager of the Water Supply and Sanitation Collaborative Council (the umbrella organization of the GSF). According to Patkar, menstruation is often neglected in discussions of sanitation and hygience. She believes that is because many of the policy makers are males, some of whom "often admit that they had never considered questions around menstruation before." Patkar sees it as particularly vital that the United Nations uses the word "menstruation" in its 17 Sustainable Development Goals, which will be ratified this weekend. Goal 6, which calls for access to sanitation and clean water for all, alludes to it: "achieve access to adequate and equitable sanitation and hygiene for all and end open defecation, paying special attention to the needs of women and girls." But the goal does not mention it by name. The Water Council is advocating for an "indicator" under Goal 6.2 that will explicitly address menstruation by measuring the percentage of women and girls who have access to information and facilities that allow them to handle their monthly period in a hygienic way. While the goals and targets of the goals are already set, the discussion about indicators will go on until March. "Managing menstruation safely clearly belongs in the water, sanitation and hygiene space under Goal 6," she says, "which aims to ensure adequate and safe sanitation and water for all." Patkar is enthusiastic about setting up open defecation free villages as part of the effort but notes that providing privacy in the form of latrines is just one step toward helping the women of the developing world cope with their period. "It is a long journey from an ODF village or community to one where women and girls no more anticipate and manage their monthly menses with fear, trauma and added burdens," Patkar says. "The fact that women have monthly recurring needs linked to their menstrual flows continues to be the single most pervasive blind spot in sanitation programs across the world."